Having one procrastinating client is bad enough. More likely, you have at least a dozen really bad procrastinators. But when 80% or more of your clients turn in their shoe boxes of receipts to you on April 1 – or later – you’re going to have problems. Because procrastinating clients can actually cost you money. Sure, you can charge them for filing an extension, but will that really cover the cost of your extra time or having to keep seasonal employees later? And then there are the demanding clients, the million-questions clients, and even the “expect miracles in 24 hours” clients. Well, fortunately, there are techniques you can use for managing clients and client expectations during a busy tax season. We get it. Taxes aren’t fun. The documentation you have to gather for them isn’t fun. In fact, finding all the documentation is one of the worst parts. That’s frequently the part that’s holding up clients from coming to see you sooner. On top of that, taxes are personal. Some people who are perfectly polite and respectful otherwise can get a little anxious, demanding, or even downright rude when it comes to preparing their taxes. So, the questions become: What are your clients expecting when they come through your door – and what do they need in order to get through the unpleasant task of filing their tax returns? What are the main things holding up your clients – and how can you, with empathy and understanding, help them better manage these things? Because managing your clients and their expectations during tax season will make things easier for everyone. Provide each client with a tax organizer (usually provided with your tax software), to help them compile their tax documents. A different organizer should be provided to business clients. You should also provide a tax appointment checklist. You might also hand out flex folders with the tax year written on the front where clients can store papers they’ll need each year. These tools make the process much easier. Your tax software provider or a tax industry vendor could provide you with an online client portal for your website, where clients can log in and upload important documents, so everything is in one convenient place for everyone to access. There are many ways to help your clients and to encourage them to develop better tax prep habits. If you can help them and make the process seem easier, you’ll likely win over a client for life. Once you’ve talked to your client about their tax situation and gotten an idea of what it will take to compile their tax documents, be very upfront about how much time it will take and what you will need from them to complete their tax returns. Most of the time, transparency with your clients is really the best way to go. For example, one bone of contention that comes up frequently between tax preparers and clients – receipts and papers. If you expect the receipts and bills to come to you already organized and prepared, make that clear from the get go. If you or someone in your office will do it, make sure your client knows what the hourly rate is for an associate to do what they could do at home themselves. Now, does that mean you should give them the nitty gritty details of how Jerome has been a little behind because he has a colicky baby at home or how Tenisse has been out for three days with the flu? No. However, take these variables into consideration so you can give your clients a realistic expectation of when to expect their returns. And under no circumstances should you allow clients to become abusive with you or your staff. If a client gets irate with someone in your office, stay calm. Talk to them to find out what the problem is as they perceive it. AFTER you have figured out the problem and everyone is calm again, let that client know that you’re happy to help fix anything that doesn’t seem to right, but you insist on civil behavior and a respectful attitude at all times. If you have any clients who are truly problems for you and your staff, don’t be afraid to fire them. It’s OK to say no to clients – and refer them to someone else if you need to. Instead of simply being available all the time, adjust your hours accordingly, so you can divide your days into head-down working time and client-facing time. Then, publicize these hours clearly and often. However, be sure to provide ways prospective clients can reach your office so you don’t lose them to competitors. Block off quiet hours when clients aren’t as likely to come in, perhaps morning, so that working a few nights and weekends doesn’t push you past (or at least not excessively past) a normal amount of hours each week. Managing your workload like this will help you and your associates find more balanced schedules while still getting the work done. Having an area of tax preparation that you specialize in could be one way of managing your workload as well as your clients. If you like working on individual tax returns but don’t want to work with small businesses, that’s fine. Or perhaps you like helping people who are self-employed, but estate taxes are something you don’t want to get into. 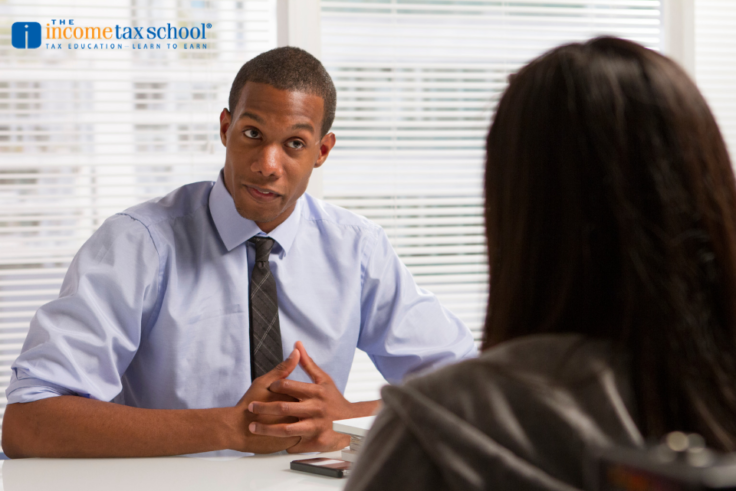 Find a fellow tax prep professional with whom you can swap referrals. That way, your clients will always get the best service for what they need and you can be clear about what your best areas are.